We have kicked off 2015 with a bang, with a big redesign of the maps page on Community Insight. The new design ensures you will be able to get the most out of the maps, with all of the same powerful features still available. The difference is that the maps are even more user-friendly and intuitive to use, look slicker, and generally awesome! 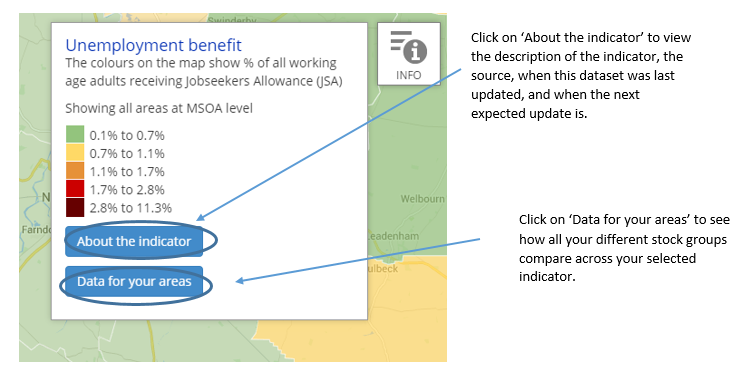 We have changed the way the indicator lists and information pop ups work, so that you can see more of the map (and more of your neighbourhoods!) on your screens at one time. Currently we are running the new maps on a beta site, which can be accessed at http://beta.communityinsight.org/ . The new maps will be on this site for the next couple of weeks, so that you can get a feel for the new style. We will then move the maps on to the live sites for Community Insight England and Wales. Please note that the report generation function and news pages are inactive on the beta site, however everything else should work as expected. Here is a little run through of the main changes you will see on the new Community Insight maps. Any feedback is greatly appreciated and if you do have any questions at all – please get in touch. We have switched the default display option for the maps from ‘satellite’ to ‘map’. Of course if you prefer the satellite view, you can switch this back on the maps page. Selecting icons causes pop ups to appear on the side of the screens. To hide these so you can see more of the map, simply click on the icon again. When you select a particular indicator on the new maps, you will see an ‘info’ icon appear in the top right hand corner of the map. Next to this you will also see a bar detailing the name of which indicator is currently displayed on the map. Clicking on the info icon will bring up a pop up containing information about your selected indicator. The pop up contains the legend for the map and details about the zoom level.